Summertime Fun on the Cheap! 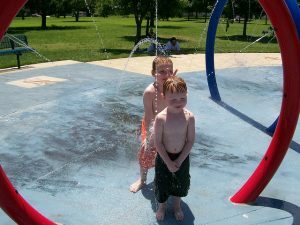 You are here: Home / Parenting Blog at KidsAintCheap / Family Time / Summertime Fun on the Cheap! Though some areas of the world may have a hard time believing it, summer is just around the corner! Summer is full of temptations to spend money. From new clothes, to summer activities and family outings, the summer season seems to be looking for money everywhere. With growing children and drastic weather change from winter to summer, children often need new clothes. Before ever buying new clothes, I always check my local thrift stores. At the rate children grow, you can get barely worn or even new clothes at a fraction of the department store prices. The other thing to check for if buying from a department store is to see if the children’s clothes comes with any guarantee. Some store brands will promise that the clothes last until the child outgrows them offering replacement or money back guarantee. Given how hard kids can be on their clothes, it may be worth the investment! I grew up on a soccer field. I know how expensive sporting events can be. Sure soccer isn’t necessarily an expensive summer sport to play, but when you start factoring tournaments and team outings, costs add up fast! To keep costs down for tournaments, the family would camp for the weekend away rather than spending money on a hotel room. We saved money on food as well since we would eat campground meals rather than restaurants for the weekend. I loved this since it combined camping and soccer in one weekend. My two favorite summer activities. I never felt like it was a ”money saving trip” or that we were doing it because we ”couldn’t” afford the hotel. A summer vacation that your kids can’t wait to tell their friends about doesn’t have to include a lavish trip away. Capitalize on your city and all that it has to offer! A staycation can be just as fun. Exploring your city with the mindset of a tourist this summer will open your eyes to many new opportunities. Check out that event/restaurant/museum that you’ve been meaning to get to, but haven’t yet. We often take advantage of places within our hometowns since we live there. Don’t delay anymore and explore! Even checking out a local hotel for a family night away will be cheaper than burning gas or airfare to leave town. Picnics are another fun summer activity. Have everyone pack their favorite foods and drive to a favorite family spot for the day. Spending time together and eating the foods everyone loves is sure to please. A picnic beach day is always fun too! If you do travel, remember our tips for travelling with children on vacation. Summer goes too fast every year. Don’t stress about money, try to enjoy it or it will be over before you know it! What are your favorite ways to save money while not compromising on summertime fun? Yeah, picnic beach and driving out of town is such a fun way to bond with family. We are just winging it and have as much as activity as we can. We’re thinking of going fishing/camping in a couple of weeks.